To a generation of gamers this phrase has come to embody something special. It was a time when console gaming was experiencing its rebirth after a disastrous industry crash in the mid 1980s. It was a time when video arcades had to share industry space with a serious competitor. It was also a time when many developers, having cut their teeth in the arcades, began transferring their talents and programming skills to the home market. Their design sense, however, did not change. Challenge was the order of the day. Sometimes invigorating, and sometimes infuriating. Some were virtually unplayable. But there was a simple maxim: Take the challenge head on, or gaming simply was not for you. Games have gotten somewhat easier over the years, no doubt about it. That’s not necessarily a bad thing, mind you, as it has forced the industry to rethink established ideas of things like HUDs, control schemes, and play-style. And let’s be honest: Some of the challenge from some of those older games came simply from terrible design. 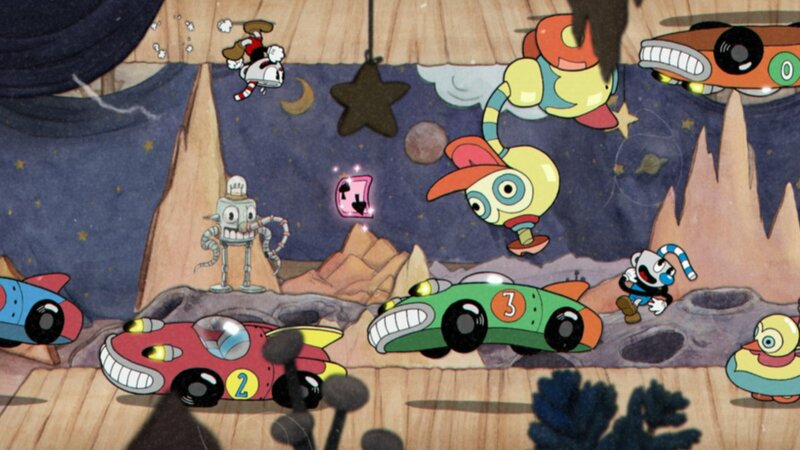 Cuphead is a hand-animated 2D Run-n-Gun action game from indie newcomers StudioMDHR Entertainment. On the surface, the game utilizes the visuals and language of vintage 1930/40s animated cartoons. The art style in particular is clearly an homage to the work of Max Fleischer and Ub Iwerks. It utilizes the surreal, dreamlike humor and imagery of vintage animation to create a visually astonishing experience. You play the eponymous Cuphead (and his brother Mugman, if you’re playing co-op), resident of Inkwell Isle and instant mascot opportunity. 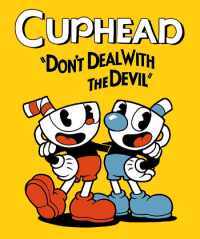 A friendly but mischievous scamp, Cuphead allows his gambling and desire for easy money to get the better of him when he bets the souls of he and his brother with the owner of a casino: The Devil himself. He loses, of course. But after begging the Devil for their (after)lives, Ol’ Scratch gives them a second chance on one condition: they must travel Inkwell Isle in order to confront some of the Devil’s debtors who have forfeited their souls, and collect them. So begins their adventure across their charmingly rubber-hosed landscape. Do not let the cutesy imagery fool you, though. Cuphead is one of the most challenging gaming experiences developed in years. Gameplay wise it has the trappings of a vintage action game: run, jump, dash, and shoot. 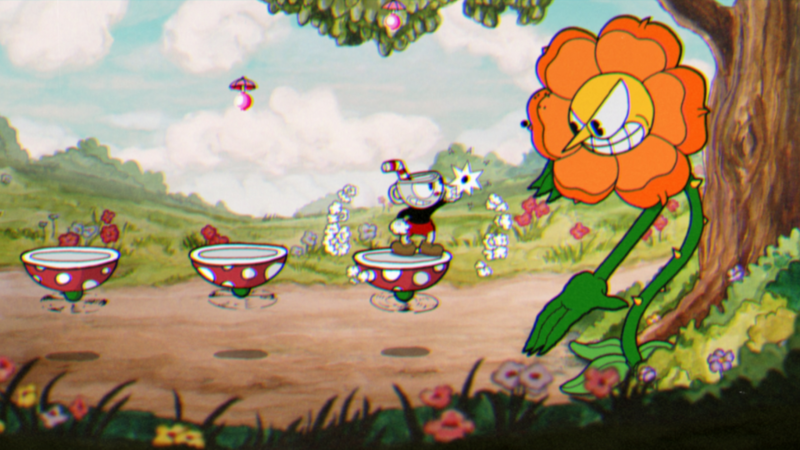 But like the challenging games of old, Cuphead takes these simple mechanics and uses them to put you through the proverbial wringer. The gameplay largely consists of fantastical and unpredictable boss fights, interspersed with occasional platforming segments that will both challenge your gaming abilities as well as allow you to obtain currency in order to purchase various power-ups and enhancements, like new projectiles and defenses. You also have a super attack that is charged by using a parry mechanic, in which Cuphead can bounce off any projectile or enemy that is pink in color. There is also a colorful overworld that hides a few secrets and challenges for the curious completionist. Look at this game. Really, LOOK at it. Nice, right? That’s nothing compared to actually seeing and experiencing it for yourself. This game is gorgeous. Every character, every movement, and every explosion has been animated by hand, utilizing the techniques of old-school animation. This game first became famous for its aesthetic and rightly so: it is no exaggeration to say that playing Cuphead is really like playing a vintage Disney cartoon. Everything bounces, moves and stretches like Felix the Cat or Mickey Mouse. Everything exudes this sense of dreamlike wonder and surreal possibility: A flower can turn its head into a gatling gun? It’s possible in Cuphead. 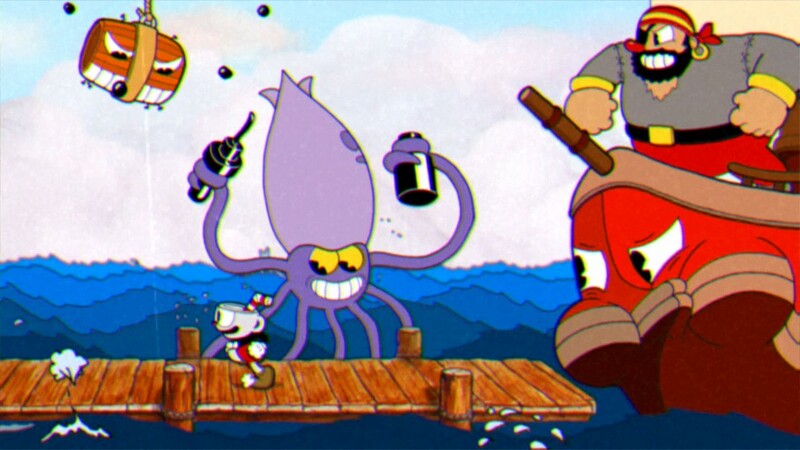 But all of these visuals would be naught but a novelty if the gameplay wasn’t solid, and with Cuphead the gameplay is not only solid, it’s fun. The platforming levels have the controlled chaos of the original Contra, with things flying at the player from every direction. The lauded Boss Fights are not only challenging, they’re downright unpredictable. This game runs on cartoon logic, and there really is no telling what a boss may do next. You may be fighting a duo of karate frogs at first, and then a deadly slot machine next. One battle may go from bullet hell to platforming in the blink of an eye. The game consistently attempts to astound you, and you will inevitably die. You will die often. But it is through failure that you learn to cope with the game’s challenges. Literally. There are no maps or health bars for the stages and bosses: the only knowledge you will have of your progress is a visual prompt after you die and the game mocks you. I am not overplaying the challenge here: this game will kick you in the teeth and mock you. Like some of the classic games it takes cues from, you will be required to step up your muscle memory and pattern recognition to survive. You will miss that one crucial parry, you will miss that one crucial jump, and you will curse the gaming gods for equipping the wrong projectile. But victory, though hard won, is always sweet in Cuphead. Yes, the game offers gorgeous visuals and engaging gameplay, but it also offers so much more. The game is loaded with shoutouts and in-jokes, not only of classic cartoons both old and new, but also gaming. One boss seems to be a take on both a classically surreal cartoon, Undertale, and Battle Kid all at the same time! You’ll find references to Street Fighter, Super Mario, Pac-Man, and even Contra! Even the gameplay sometimes is a throwback to classic titles (no spoilers, but let’s just say you’ll be shooting at aliens through your own shields). And of course, one of the most satisfying aspects of Cuphead is actually beating it. This game really squeezes you like a grape in a wine press, but when you come out on the other side you will feel like a million bucks. So if you love modern challenges like Dark Souls or Tohou Project, and relish the unforgiving nature of classic gaming, then Cuphead is definitely for you. And even if it isn’t, give the game a try! You’d be surprised what you work through. …Also, this game reminds me that old-timey animation was pure grade-A nightmare fuel. Holy crap that flower is terrifying!